EARLY BIRD SALE! BUY YOUR TICKETS NOW - limited time only !! Join us for BWP's first, annual benefit dinner in support of the elephants and rainforests of Borneo. 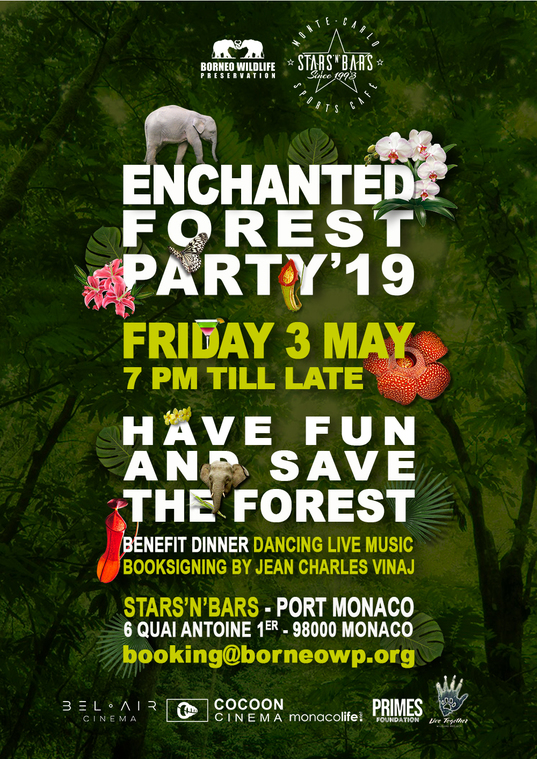 OUR EVENT: Our "Enchanted Forest Party" on Friday, May 3rd at Stars 'N' Bars in Monaco, will be an evening of fun. Expect fantastic food, entertainment, gifts and a silent auction with a few special surprises. Take a glipse at the rare beauty that exists on the third largest island in the world. "Live Together" book signing by French wildlife photographer, Jean Charles Vinaj who's wildlife photography aims to encourage humans and animals to live in harmony. Performance by international musical duo, Pacha & Pote. Our goal is to raise funds for the Borneo Elephant Sanctuary, the only of its kind in Borneo. This sanctuary will provide food and a safe haven for orphaned, displaced and injured elephants currently in captivity in Sabah, Borneo and provide a gateway for translocating wild elephants into the Lower Kinabatangan Reserve. Future events will raise funds to purchase and replant rainforest migration routes. Providing food and medical supplies for injured elephants and fund education field trips for local schools to help the next generation learn about the importance of wildlife conservation. 7pm - 9pm BOOK SIGNING: Jean Charles Vinaj "LiveTogether"
ENTERTAINMENT: PACHA & POTE - A musical duo, well known in the French Riviera with international awards and gigs. They performed in Monaco during the International Film Festival of Monte Carlo. Pacha (Francesca Ferrara) was last years winner of "Sanremo Canta Napoli" and is a recognized saxophonist and pianist.They are sure to turn this evening into a brilliant and engaging party with music mixing and entertainment!